Slip away to the peaceful beach atmosphere of Unit 415 at Holiday Surf and Racquet Club to enjoy mesmerizing views of the Gulf of Mexico. Our 2BR/2BA condo is the perfect home base for your beach getaway. The unit has been completely renovated and is just steps from the private beach. Sleeping 6, this clean, spacious and well appointed 2BR/2BA condo provides the perfect setting for the vacation of your dreams. Featuring a new king mattress in the master bedroom, a queen in the second bedroom and a sleeper sofa, there is plenty of space for you and your guests. The condo features tile flooring throughout, a fully furnished updated kitchen with granite countertops and newer appliances, a large eat-in dining area with dry bar, 2 full bathrooms (the master features jetted tub). Enjoy the beauty of the white sand beach from the newly renovated private balcony with a table and four chairs, and view of the pool, pool deck, tennis courts, shuffleboard, and full private beach. Complimentary cable to be enjoyed on your choice of three flat screen televisions. Wifi included. Property amenities include: newly renovated outdoor heated pool area, sauna, tennis courts, shuffle board, fitness center, activity room with kitchen, newly renovated laundry facilities near the unit, gated entry, and 300 feet of private beach. New ownership as of February 2018. Dave and Rachel are from Lakeville, MN. Dave grew up in the Minneapolis area and Rachel is from Iowa (Go Hawks!). We have four teenage children. We enjoy spending time with our extended family and friends, which is what prompted us to purchase a second home an easy flight away from the cold northern winters. 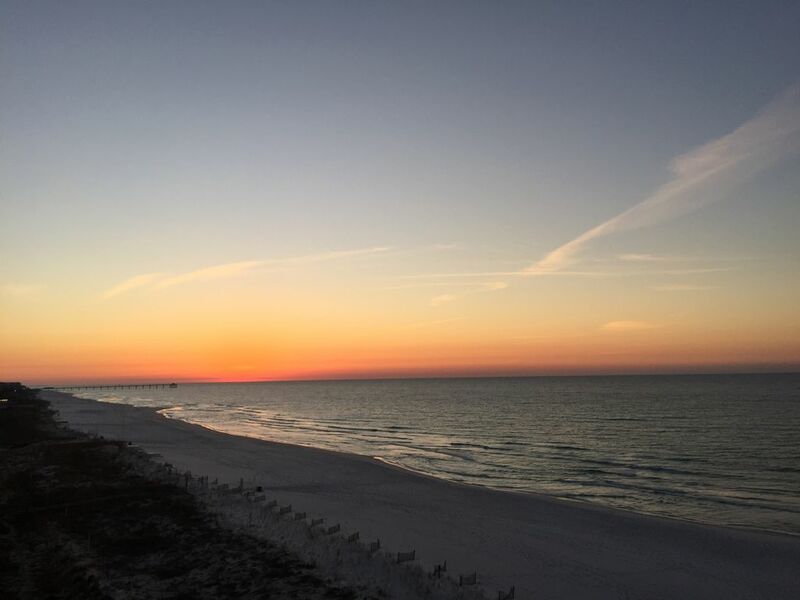 After traveling to several beachfront locations, we fell in love with the Destin area for its beautiful beaches, family oriented atmosphere, great restaurants, shopping, entertainment options, and airport convenience. Our condo is beautifully appointed and you will feel at home the moment you walk through the door. We welcome you and are available for any of your needs. Our condo has a private balcony overlooking the pool deck area, tennis courts and shuffleboard with a spectacular view of the gulf. Situated perfectly for mornings enjoying your favorite coffee or evening with a glass of wine, you will always have the perfect view of the surrounding area. Waking up to a water view is truly unique to our condo, with a gulf facing master bedroom with a separate door to the balcony. Beach chairs, umbrellas, body boards, and inflatables included. Boogie boards, inflatables, beach chairs (2 adult and 2 child) and umbrella available. Beach wagon available. The staff at Holiday surf was very nice and helpful the harbor walk was nice with music etc. McQuires restaurant was fabulous! This area is beautiful with tons to do we loved our trip!! We enjoy staying on Holiday Isle because of the location. It’s close to restaurants and shopping, in addition to Gulf Shore Drive being one of the prettiest streets in Destin. This condo always feels like home and we have stayed there a number of years. It’s very well maintained and clean. In addition, Dave and Rachel, the owners, are very easy to work with. They are on top of things. This year the refrigerator acted up and they immediately replaced it with a new one. We like the view of the Gulf from the balcony. HSRC has a heated pool, shuffleboard courts, and tennis courts, as well as easy access to the beach. It’s a great place to stay and we are looking forward to returning next year! Thanks for everything!!! We enjoyed our stay and can’t wait to return! It was so clean and the perfect view from our balcony!! As we conclude our six-day stay, I am happy to report that this was a magnificent place to vacation. This condo has EVERYTHING we could possibly need, from an umbrella, boogie boards, chairs, beach toys, and a wagon to various blankets of varying warmth and linens to a well-stocked kitchen and top-of-the-line appliances! The pool was amazingly clean and perfectly temperatured on the days when the surf was too much. The beach was RIGHT THERE! I think that might be my favorite part. Ride down the elevator, the front desk staff says friendly things to you, walk through the pool area, over a small bridge, and there is the water! Plus, the location was close to the Louisiana Lagniappe and not too far from Mcguire's or Wal-mart. Additionally, the owner of this condo offered us a 100% refund two days before Hurricane Michael hit the Panhandle if the hurricane had caused damage here which, thankfully, it didn't. We will DEFINITELY be back, as we now consider this our premiere Destin vacation condo. Wow, thank you for all the nice words. We do visit there often and try to make sure everything is in order. We will gladly welcome you back! This was our second time at this complex; both were in the off-season (mid-May and October). This unit was well furnished and comfortable. We had to leave for a couple of days due to hurricane Michael (which ended up doing no damage here). We had not purchased trip insurance and so expected no compensation, but the owner generously refunded 2 days' rental cost, which was greatly appreciated! We've enjoyed both of our stays at Holiday Surf and would stay here again. Thank you very much for the wonderful review. I appreciate you bringing in items from the balcony to prepare for the hurricane. Im sorry your stay was interrupted by bad weather but glad you still were able to enjoy some beach time. It was a wonderful place to stay! It was very clean and so nice and comfortable! We enjoyed the ease of walking right out to the beach or the pool!